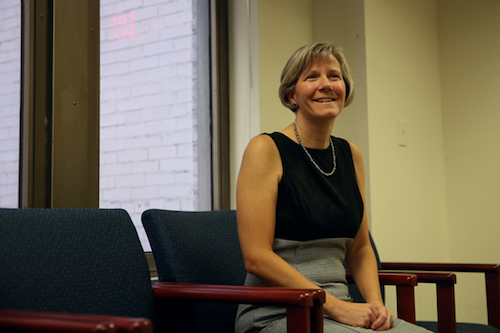 Laurie Koehler, the vice provost for enrollment management and retention, said GW’s new test-optional policy helped to create the most diverse freshman class in University history. Hatchet file photo by Dan Rich | Photo Editor. Updated: Nov. 21, 2016 at 3:22 p.m. The Class of 2020 is the most diverse group of students in University history, officials announced Monday. Officials enrolled a freshman class of 2,523 students out of the more than 10,000 prospective students admitted to the University. About 40 percent of applicants for the class were accepted at GW. The Class of 2020 includes a 33 percent increase in students from underrepresented minority groups, which now make up 20.2 percent of this year’s class, compared to last years 14.9 percent. Laurie Koehler, the vice provost for enrollment management and retention, said in an interview Monday that while the University does not set numerical targets for any specific populations, she and other officials acknowledge the benefits of a diverse social and classroom setting and will continue to work toward improving diversity on campus. “There is an obvious benefit to students from learning from each other, from people with different perspectives,” Koehler said. The number of black freshmen increased by 84 percent, from 4.7 percent of last year’s class to 8.8 percent for the Class of 2020. Similarly, Hispanic student enrollment rose by 11 percent, from making up 9.2 percent of last year’s enrolled class to this year’s 10.5 percent. The number of freshman who receive Pell grants – federal funding given to low-income students that does not have to be repaid – also increased, with 15 percent of the class receiving the class compared to last year’s 13.8 percent, according to preliminary numbers. This figure has now been steadily increasing at GW for more than a decade. The percentage of first-generation students also increased by 14 percent from last year, with 13.9 percent of this year’s freshmen identifying as a member of that group. Students and officials have focused on supporting this group of students over the past year, with the addition of office hours and monthly dinners for first-generation students. Koehler partially attributed the rise in diversity to the new test optional policy in which GW no longer requires SAT or ACT scores from applicants as a way to attract more underrepresented groups. Of the total enrolled class, 29 percent did not submit test scores. This was the first applicant pool under this policy. Improving accessibility for students has been a major focus of the Knapp administration in recent years. More than two years ago, Knapp unveiled a task force on access and success to help bring more low-income students to campus. And he and Koehler have both prioritized helping students stay and succeed at GW over the past year, including several partnerships with groups that help bring minority students to campuses. Koehler said admissions offices across the country acknowledge that high school course difficulty and GPA are more accurate predictors of future academic success than test scores. While test scores were not considered for nearly a third of the enrolled class, the median academic GPA did rise from 3.64 last year to 3.66 this year. The yield rate, or portion of admitted students who actually end up attending GW, also dropped to 24.7 percent from last year’s 25.5 percent. Koehler said that more than half of the applicant pool had applied to an average of 10 universities, which can make it more difficult to determine which institution an admitted applicant will enroll at. The fastest way to improve the yield rate would be to admit academically weaker students, a step GW is not considering, she said. The applicant pool for the Class of 2020 increased by 28 percent, the largest jump in more than a decade. Officials remained within their goal of enrolling 2,500 to 2,600 students. The Hatchet incorrectly reported that more than half of admitted students had applied to an average of 10 institutions. That statistic applied to the entire applicant pool, not just admitted students. We regret this error.